Grow & Behold delivers anywhere in the USA, right to your door. You do not need to be part of a Buying Club to order. 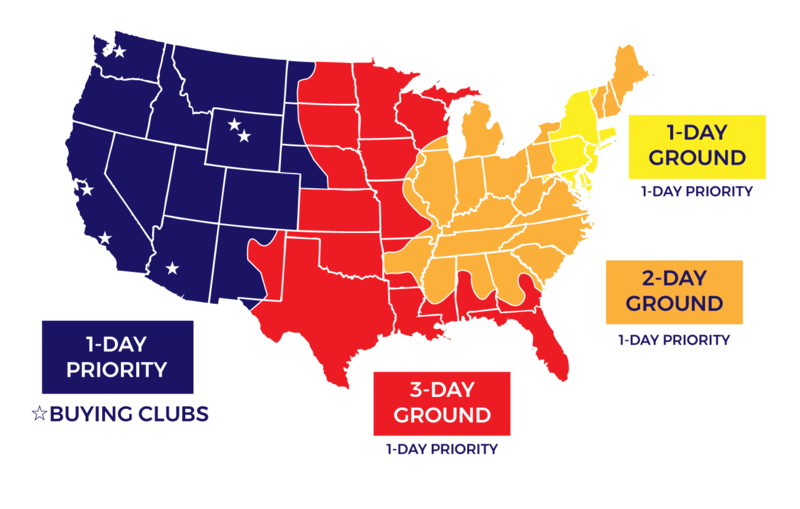 However, to help customers in our Priority shipping range (dark blue on the map below) save on delivery costs, we offer group shipments 7-10 times per year to communal pick-up locations. a commitment from at least 10 people who want to order with the club. If you have a smaller group, consider placing an order together and splitting the shipping. a location that is open to the public that can receive deliveries by pallet (generally a synagogue, JCC, school, etc.). Access to a freezer, fridge or room with air conditioning is a plus. a coordinator who will assist in receiving the delivery, helping people find their orders during pick-up and rescheduling in the event of delays. The coordinator will receive store credit based on the total weight of each delivery (this can be used for the coordinator, or by the host institution). If you think you meet the above requirements, please contact us to start a Buying Club in your area.